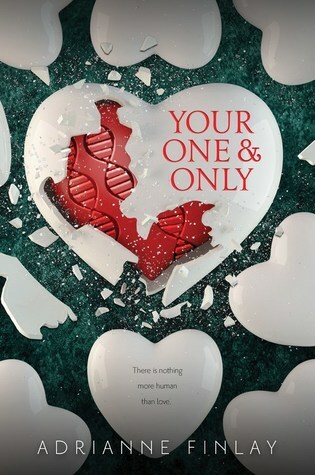 We're excited to have Adrianne Finlay stop by to share more about her debut novel, YOUR ONE & ONLY. Adrianne, what was your inspiration for writing YOUR ONE & ONLY? In an article I read about the ethical implications of cloning a Neanderthal, it suggests that it would be morally irresponsible to do so, because the extinct Homo sapiens would have no connection to our modern world—no community, no family, no culture, not even the foods he would have been accustomed to. That started me thinking. I loved the idea of a story about a character so radically out of place, so mismatched, the only one of his kind. Instead of writing a Neanderthal main character, I imagined a future where humanity had evolved into nine different models of genetically altered clones. Those clones create the first new human in centuries. For the clone society, he is a sort of Neanderthal, primitive and distinct even opposed, to the world that created him. So that article inspired me to explore the assumptions we all have about individuality, family, and community. Lois Lowry’s THE GIVER was a huge influence on me, and I love Lauren Oliver’s DELIRIUM series. Claudia Gray’s DEFY THE STARS shares common themes with YOUR ONE & ONLY, and for great sci fi I always recommend S. J. Kincaid’s THE DIABOLIC. I love writing in the lively environment of a coffee shop and listening to music on my headphones. I tend to get stuck on one to three songs and play them over and over. My local coffee shop knows me now because I’m there so much, and they usually have my tea order ready before I get to the counter. Also I find it helpful to get out of the house, where there are too many distractions, like laundry, television, and kids. The most important advice I would give is to write for yourself. Do it because you have a story you need to tell, a story you wish you could read that doesn’t exist yet, or simply because you enjoy writing. Having a goal, like publishing or sharing your work in some way, is great, but that can’t be the reason you write or even the main goal. Goal posts move with each accomplishment, but what it always comes back to is writing because you love the process of telling stories. Originally from Ithaca, New York, Adrianne Finlay now lives in Cedar Falls, Iowa with her husband, the poet J. D. Schraffenberger, and their two young daughters. She received her PhD in literature and creative writing from Binghamton University, and is an associate professor of English at Upper Iowa University in Fayette, Iowa.She is also an avid soap maker, and sells handmade soap locally to raise money for type 1 diabetes research. Have you had a chance to read YOUR ONE & ONLY yet? Have you had a story inspired by an article you read? Do you write for yourself? Share your thoughts about the interview in the comments!